How To Get To Little Tokyo Makati? Have you noticed that small complex of Japanese restaurants along Pasong Tamo (Chino Roces Avenue) in Makati? It might seem to be very subtle for the unobservant eye but once one steps inside the very neat community of Japanese restaurants in Makati, the feeling would transform from Makati "bustling city" to Japan "zen aura". 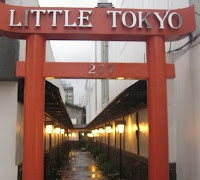 Enthusiasts, businessmen, tourists, or even couples going out on a date should place Little Tokyo on their dining list. Seryna - with steady diners packing up the restaurants. Be sure to reserve before going there. Even if most people who have been to the restaurants in this Japanese village say that the prices are really high, this place is still a must-visit. If it's pay day, a loved one's special occasion, or luxury dining day, then this is where one can make every peso spent worth it! Sub-Option A. Get down at Magallanes and walk to the corner of Pasong Tamo. There would be jeepneys with routes "Ayala-Mantrade", "Washington-Mantrade", "PRC Mantrade Kayamanan C". Take any of these jeepneys and ask the driver to drop you off Little Tokyo, Herrera or Makati Cinema Square. This is most recommended for first time travelers as this is the most convenient. Sub-Option B. Get down at Ayala. Walk towards Park Square 1 jeepney terminal and ride the jeepney bound for Libertad (via Pasay Road) and ask the driver to drop you off Little Tokyo, Herrera or Makati Cinema Square..
Sub-Option A. Get down at Magallanes MRT Station and walk to the corner of Pasong Tamo. There would be jeepneys with routes "Ayala-Mantrade", "Washington-Mantrade", "PRC Mantrade Kayamanan C". Take any of these jeepneys andask the driver to drop you off Little Tokyo, Herrera or Makati Cinema Square. This is most recommended for first time travelers as this is the most convenient. Sub-Option B. Get down at Ayala MRT Station. Walk towards Park Square 1 jeepney terminal and ride the jeepney bound for Libertad (via Pasay Road) and ask the driver to drop you off Little Tokyo, Herrera or Makati Cinema Square. Sub-Option B. Get down at Ayala. Walk towards Park Square 1 jeepney terminal and ride the jeepney bound for Libertad (via Pasay Road) and ask the driver to drop you off Little Tokyo, Herrera Street or Makati Cinema Square..
Sub-Option B. Get down at Ayala MRT Station. Walk towards Park Square 1 jeepney terminal and ride the jeepney bound for Libertad (via Pasay Road) and ask the driver to drop you off Little Tokyo, Herrera Street or Makati Cinema Square. Option 3. From Pasay/Baclaran, ride a jeepney going to Alabang and get down at Magallanes. Cross EDSA and go under the Magallanes flyover going to SLEX, jeepneys going to Pasay Road pass by under the Magallanes-SLEX flyover. Ride a Pasay Road-Libertad jeepney and asked to be dropped off the corner near Makati Cinema Square. Walk towards Little Tokyo after getting down. Option 4. 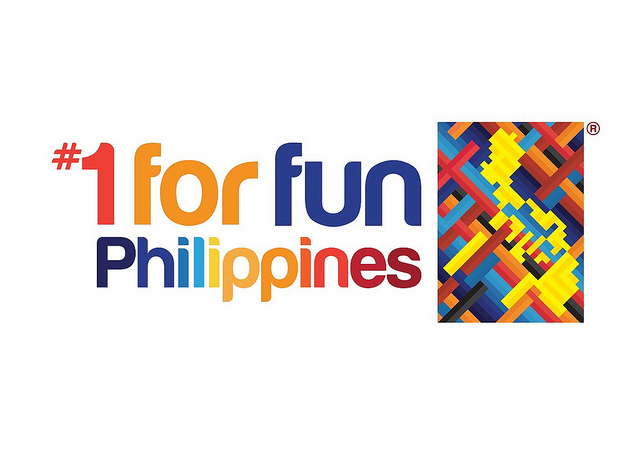 From SM Mall of Asia, ride a jeepney bound for Don Bosco/Pasay Road, go down at the corner of Pasay Road and Pasong Tamo and walk towards Little Tokyo. If you are commuting from around Makati, you can take the following jeepney routes "Washington-Libertad", "Pasay Road-Libertad", "Ayala-Mantrade", "Washington-Mantrade", "PRC Mantrade Kayamanan C". If you are coming from Taguig or Pateros (C-5 Area), take a jeepney going to Market! Market! and from there take a jeepney or bus bound for Ayala-EDSA, and then follow Option 1.B from either of the "from the north" or "south" commute routes from above. You can also take a jeepney bound for Guadalupe and follow either of the routes coming "from the north". For private vehicles: Little Tokyo Makati is along Pasong Tamo (Chino Roces Ave.), beside Makati Cinema Square. 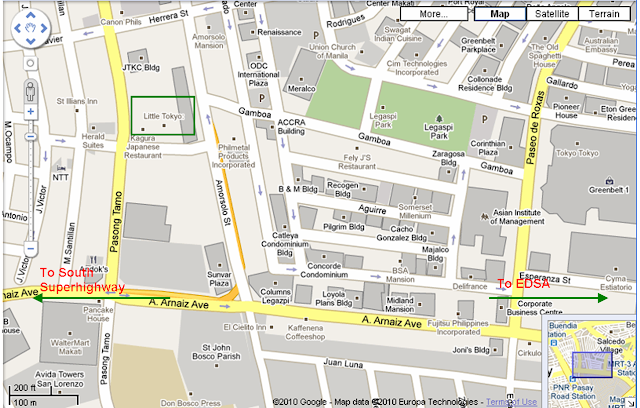 It is situated between Arnaiz Avenue (Pasay Road) and Herrera Street (V.A. Rufino). Little Tokyo Makati has ample parking in front and at the back. Of course, take note of the MMDA Number Coding Scheme implemented in Makati. If you are coming from EDSA southbound, you can take a right turn at Ayala Avenue, then turn left at Makati Avenue and then turn right at Pasay Road, turn right at Amorsolo Street (you'll see Don Bosco on your left side), left at Herrera and then another left on Pasong Tamo (landmark is Shell station); Little Tokyo would be on your left side. Another option from EDSA southbound (which is easier to remember) is to take a right at Pasong Tamo under the Magallanes flyover and just go straight until you cross Pasay Road with WalterMart to your left (Arnaiz Ave.) and get past Makati Cinema Square and reach Little Tokyo (to your right). If you are coming from SLEX from the south, take the Don Bosco street - this is the first street crossing the PNR railways from Magallanes. Then turn left at Pasong Tamo and just go straight until you cross Pasay Road with WalterMart to your left (Arnaiz Ave.) and get past Makati Cinema Square and reach Little Tokyo (to your right). Of course, you can ride a taxicab from any area around the Metro and ask the driver to drop you off "Little Tokyo Makati" or "Makati Cinema Square". Share us what you think of the restaurants through the comments section below. We appreciate it a lot! 85 Responses to "How To Get To Little Tokyo Makati?" How do I get to Technolux Office in La Paz, Makati from LRT buendia? ride a taxi and tell the driver to get you to Technolux Office in La Paz. how to get to Media Resource Plaza Mola Makati from MRT Ayala or LRT Buendia? You should enter on the arrangement for the blog. You can present it’s primary advantage. Your blog explorings would enlarge your browsers plus . Exactly what is the difficulty about it hacked games for cost-free on Android AppValley iOS AppValley resembles numerous various other applications.